We offer a huge variety of brushes that are available in different sizes, designs and tolerances. These can be made of different material composing graphite and allied metal powder as per the specific application and requirement. 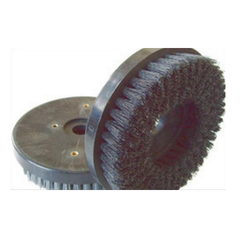 Abrasive Brushes is used for antique stone. With professional quality and suitable price, the brushes are made by top-quality nylon and the type includes Frankfurt /Fickert /Round /Snail lock etc. Our Archaing Grinding brushes are all made out of DUPONT TYNEX A, which can gain more fantastic archaized effect of stone surface. We are highly acknowledged organization engaged in presenting remarkable range of Synthetic Filament Brush. - Specially designed to offer perfect polish for uneven and rough surfaces and make beautiful glazed tiles from rough stone slabs. - The Abrasive Touch offered by us adds an antique touch with premium polish to ceramic tiles and marble slabs. Hi Tech Diamond Tools Pvt. 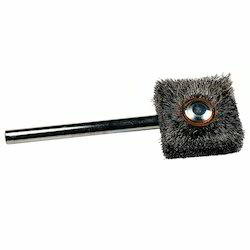 Ltd.
Abrasive Brush is perfect for all-over application and blending of foundation, powder and mineral makeup products. With the help of our experienced engineers, we have been able to design and develop Abrasive Nylon Brushes.